Here’s the official lineup of workshops for Sunday. Most of the workshops will be held in the Magnolia building, but check the onsite program for exact locations. UPDATE: All the workshops are held in the Magnolia building EXCEPT Making Comics and Redesigning Halloween, which are held in the Studio One Theater. The Amazing Adventures of Kavalier and Clay author Michael Chabon and Marvel Comics artist Nick Dragotta team up in this hands-on workshop to show how to create comics, from building characters to putting them in a story. Get there early–space will be limited! 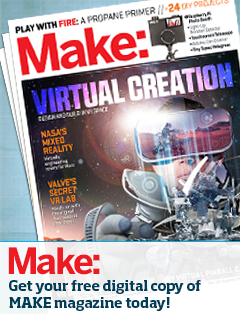 How do you make a maker? Come meet the quintessential maker family, the Winters. Michael Winters is the founder of Crazy Research company and co-founder of Stupid Fun Club. Ellen Winters is a former Curriculum Specialist and Director of Research and Development for Out of the Box, a board and card game publisher. Lauren Winter has a BS in Mechanical/Electrical/Software Engineering, and has built numerous custom model cars, slot cars, radio controlled cars and a wide variety of other vehicles including a 1/24 scale amphibious off-road vehicle. Lisa Winter is a lifelong crafter whose hobbies include machining, printmaking, soldering, building bikes, playing the fiddle, and cooking. Steven Winter is a maker of just about anything, including Arduino electronics projects, furniture, Burning Man projects, musical instruments, Max/MSP/Jitter plugins and unique camera accessories. Cut out and decorate your own cape from any of the cool fabrics and/or donated clothes at the swap. (No sewing required!) You can wear it with your Halloween costume…. or perhaps for your everyday magical attire? Robin Johnson Simpson demonstrates the art of soap making. Founder and CEO of O’Reilly Publishers Tim O’Reilly brings his DIY sensibility to one of life’s simplest pleasures: making jam. Tim will also bring along his favorite scone recipe so you can try it at home. Thinking about having a blog–for yourself, your family, your kids, your ideas? Join Oakland Local co-founders–and long-time bloggers Susan Mernit and Kwan Booth in this hands-on, easy-to-follow workshop on a great way to make your voice heard. Founder of MAKE Magazine, co-founder of O’Reilly Media, and creator of Maker Faire Dale Dougherty shows how to make apple cider with a cider press. Stanford’s school of design leads an interactive workshop for kids and parents with a challenge to re-envision and re-engineer the Halloween experience, using as a foundation design concepts presented by the d.school. Fun for the whole family! Founder of MAKE Magazine, co-founder of O’Reilly Media, and creator of Maker Faire Dale Dougherty mines his own vast experience in a talk about how to inspire young people to become makers. Don’t miss this fascinating talk by one of the heroes of the Maker movement. Ben Riddell and Duke Ferris of the Alameda County Brewers Club (AC/BC) demonstrate how you can brew up your own beer. Bonsai expert and past president of the East Bay Bonsai Society Bill Castellon leads a workshop on the ancient Japanese art of Bonsai. Bill has given demos for various garden and Bonsai clubs in California, and has studied with many Japanese masters. Learn more about Bill and Bonsai at http://www.billcastellon.com.